To ensure the pH level of handmade cold process and hot process soap is at a safe level. The pH test strips come packaged in a plastic vial with 100 strips. Immerse plastic strip in test solution. 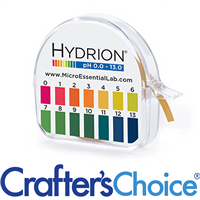 Remove strip and immediately match to color chart for accurate pH measurement. CP Soap: Lather a small sample of cp soap from your batch in water. Rub the pH strip on the wet sudsy soap. Match strip to color chart for pH measurement. "What is the ph value for cold process soap?" Staff Answer The pH of cold process soap should be between 8 and 10.5. "How Many Tests can you get with this?" You can get over 30 tests with the strips.